The Yamaha YM-6100 5 Octave Marimba was designed in conjunction with world-renowned marimba legend Keiko Abe. The YM-6100 is the culmination of over 40 years of instrument development with Keiko Abe and is the industry-leading flagship for all Yamaha marimbas. 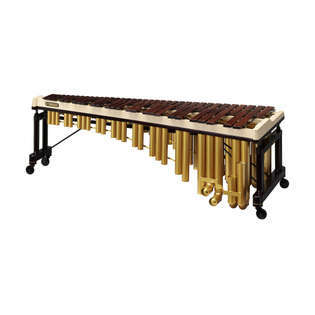 Height Adjustable: Pneumatic strut system 34 5/8" – 40 1/8 "
Dimensions: 108 ¼ " x 45 ½ "
We have this and 4 other marimbas at my school and this sounds the best. Out of musser, adams, demorrow, dynasty, and majestic I feel that the sound of these bars is superior to those other brands (however our demorrow is really close, and its an awesome value). Every note is really clear, and you don't get that harsh, thin sound like the Adams bars. From the highest note to the lowest there is a homogenous sound which makes this instrument sound really really nice. One of my teachers has a Marimba One and I think this is just as good, and its easier to move! My drum studio owns this marimba, and it is fantastic! It has brilliant tones and a very nice finish; the bars are rosewood and the frame is polished and sturdy. It is also incredibly easy to transport - the entire thing can fit into a minivan! the resonators break down into the sections, the slats fold in half, both end frames can be removed, and the bars can be rolled up. It is ultra portable and sounds amazing! Definitely buy this!